The Rangers (20-14-4) hit the halfway point of the season today and continue their three game home trip as they take on the Washington Capitals (30-7-3), currently holding a one point lead over the Dallas Stars for the President’s Trophy with one game in hand. This is the third straight game where the Rangers will play one of the elite teams in this league, having been shut out by the streaking Florida Panthers in Sunrise, Florida, before bouncing back with a dominant 6-2 win over Dallas at MSG. Now they must take on their division rivals, a team they’ve faced so many times before, a team that’s 11-1-1 in their last 13 games, and a team looking for their 31st win in the first half of the season win. Two consecutive wins over the Stars and Capitals could be a turning point of this season, so the Rangers must be at their best tonight. This is the third time that the Rangers and Caps will face off at Madison Square Garden, with two more games planned for the Verizon Center on January 17 and March 4. The Rangers took down the Caps back in November, scoring four times on the first 10 shots against Braden Holtby, and ultimately scoring five goals on 21 shots. In December, it looked like the Rangers were going to do the same thing after jumping out to a 3-1 first period lead, but the Capitals scored six unanswered goals and won 7-3. The Rangers have been road warriors the last few seasons, but nobody has talked about the Capitals. Their 4-1 win over the Islanders on Thursday put them at 2-1-1 for their road trip, and they’re now 15-4-2 away from DC this year. Dating back to the beginning of last March, the Caps are 21-5-3 in their last 29 road games. Washington will be down two forwards because of suspension, and had to recall Paul Carey from the AHL. Zach Sill still has a game to serve of his suspension, and Marcus Johansson will sit the next two games for his hit on Islanders’ defenseman Thomas Hickey. Ovechkin is approaching a milestone, sitting just three goals shy of 500 for his career. A hat trick against the Rangers would give him 500 goals in 800 NHL games, an incredible and remarkable feat. Ovechkin currently has 22 goals and 35 points this season. Braden Holtby continues his rise as one of the elite goalies in this league. Barry Trotz likes to play his goalie, A LOT. Holtby has started 33 of the team’s first 40 games, winning 26 of them and posting a 1.90 GAA and a .933 save percentage. For the Rangers, Henrik Lundqvist is looking to build off of a pretty strong performance against Dallas. He allowed one weak goal to John Klingberg, but made 21 saves on 23 shots. Chances are that he will face a high volume of shots today, and a good performance from him could be a good confidence builder. With Chris Kreider still sidelined with a laceration on his hand, and Emerson Etem shipped out to Vancouver, Jayson Megna will remain in the Rangers lineup. He played well on the second line, picking up a goal and an assist in 12 minutes of ice time. He was strong on the forecheck, positioned himself well for scoring chances, and beat Niemi for his first goal in a Rangers uniform. He is going to be the new spare winger moving forward, but this is an opportunity for him to earn playing time. I’m looking for JT Miller to continue his excellent play as of late. He’s taken advantage of his time on the top line with Derick Brassard and Mats Zuccarello, picking up a point in seven of the last 10 games, with eight points (4-4-8) in that span. He’s solidifying himself as one of the best wingers on this team, and he’ll get his chances tonight. Special teams will be crucial tonight. Washington has the second best power play in the league, scoring 31 goals on the man advantage and putting chances away at a 25.4% clip. Everyone knows Ovechkin’s strategy, taking one-timers from the left faceoff circle, but he still has seven power play goals this season. The Rangers are killing 80.5% of their penalties, but have killed off 87.9% of their penalties at home. 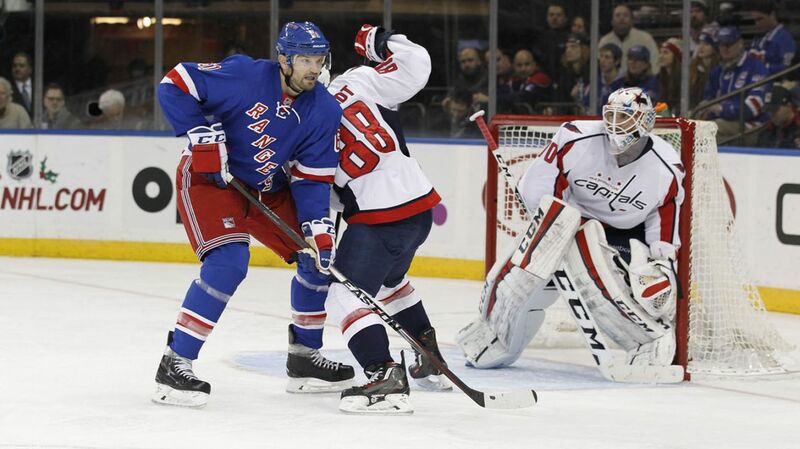 The Rangers and the Capitals will face off at Madison Square Garden at 1 PM. The game will be broadcasted on MSG Network. Posted on January 9, 2016, in Game Previews and tagged Alain Vigneault, Antti Raanta, Chris Kreider, Dallas Stars, Dan Boyle, Dan Girardi, Derick Brassard, Derick Stepan, Dominic Moore, Dylan McIlrath, Emerson Etem, Henrik Lundqvist, Holtby, Jesper Fast, JT Miller, Justin Williams, Keith Yandle, Kevin Hayes, Kevin Klein, Kuznetsov, Madison Square Garden, Marc Staal, Mats Zuccarello, MSG, New York Rangers, New York Rangers blog, Nicklas Backstrom, NYR, Oscar Lindberg, Ovechkin, Rangers, Rangers blog, Rick Nash, Ryan McDonagh, TJ Oshie, Viktor Stalberg, Washington Capitals. Bookmark the permalink. Leave a comment.